There are a few options of moving around the city, depending on your budget and the level of comfort you need, from the cheapest one, such as angkot to the most comfortable one, car rental. 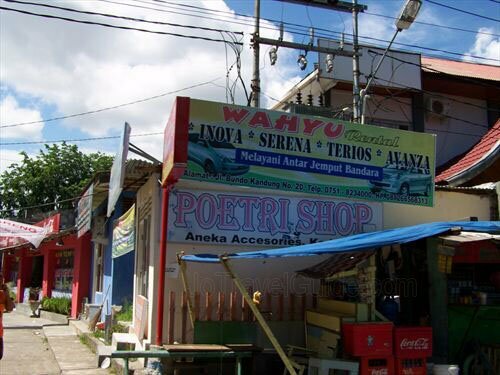 Apart from angkot and car rentals, there are "ojeks" and taxis. There are also bus services to nearby towns. Traffic jam within the city is still "tolerable". Mostly it occurs in front of Plaza Andalas and Basko Grand Mall in the morning and in the late afternoon, when residents commute between their homes and their offices. Exploring the city on foot may not be a popular option because of the weather condition, however, should it become your decision, wherever you walk in Padang, you should pay extra attention to local drivers and motorbikers. It is seldom to see drivers giving way to pedestrians and people can cross the roads anywhere they like. The most common way for locals to move around is by Angkot, small public minivans. You will see these angkots in many colors: white, orange, light blue, dark blue, yellow, purple and so on. Most angkot in Padang is painted in various color and motifs, and play music to be more attractive. Their fares really depend on your travelling distance. It'd be better to ask other passengers (or the driver) for the right fare. As a rough idea, a short distance of about 1-3 kilometer, such as a trip from Pasar Raya terminal to Plaza Andalas, will cost you about Rp. 2,000, while a way longer distance will normally be around Rp. 5,000. Give the money to the driver when you are getting off. All angkots don’t have air conditioning, and they have a side passenger door opening for the passanger’s entrance and exit. 10 Passengers can be squeezed in this small minivan, sitting facing each other, usually with 4 on the left side and 6 on right side of the minivan. If you are a really tall person, then you will have a problem in making yourself comfortable in there. 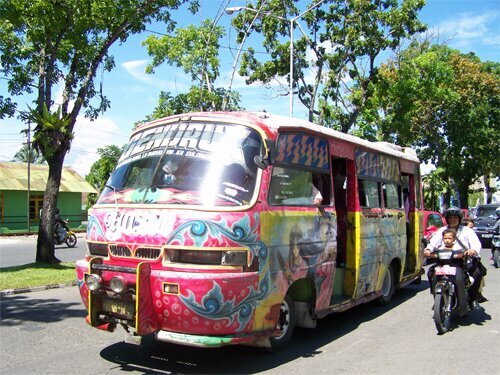 However, when roads are gridlock-free this angkot can save some of your time. 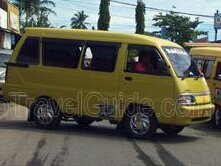 Angkot drivers have habits to honk to get passenger’s/people’s attention, and everybody who is standing on curbs. If you want to get off at a specific place, you have to tell the driver the name of the place before hopping on his minivan. If you know that the mikrolet doesn't go nearby your destination, you can ask the driver if it would be possible to drop you off there, though he might ask for an extra cost, which needs to be clarified before getting on. However, if you are in doubt, ask local people around you for the right direction and they are in general helpful and friendly. Ojek is actually an unlicensed motorcycle/motorbike taxi and is popular because it brings its passenger faster to his/her destination and to places where angkots don't go. It can be recognized by self-made signboards that say “Pangkalan Ojek” and they can be found in some streets such as next to Ion hotel. Ojek drivers often 'signal' everybody who is standing on curbs by either honking or saying “ojek”? Most of them speak Bahasa Indonesia only, though a few might be able to speak limited English. The fare is negotiable. Just tell your destination and once the fare or "ongkos" is agreed he will take you there. As a reference, a 2 kilometers distance costs about Rp. 5,000. Fare is usually paid at destination. Taxi is a more comfortable option if you want to avoid the tropical heat and getting to your destination faster. The "taxi argo" (how the locals nicknamed it) usually applies a Rp. 20,000 minimum charge. The flag-down fare starts at Rp. 6,000. 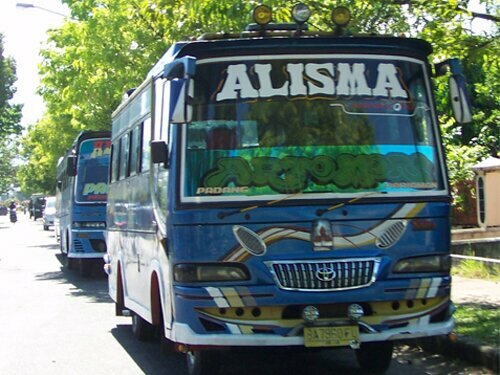 Transportation to Bukittinggi or other places nearby Padang can be done by public buses from around Basko Hotel, or you can ask the locals where to get a bus to Bukittinggi, as currently there is no official bus terminal in Padang. It takes about 2 hours to reach Bukittinggi and expect to pay Rp. 20,000. 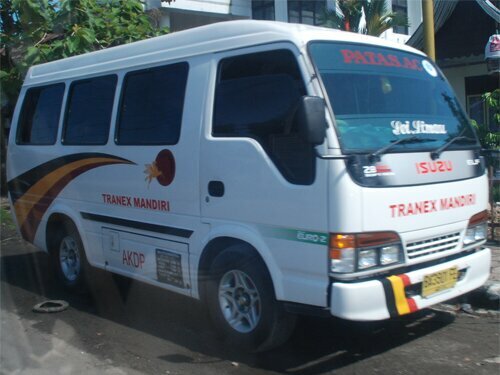 Alternatively, take the Tranex Mandiri shuttle minivans (see picture on the right) that usually goes along the main street between Padang and Bukittinggi. Expect to pay Rp. 30,000. Car rental is the most efficient and comfortable way to explore places of interest in Padang and surroundings. A car rental with a driver is highly recommended, unless you are familiar and comfortable with the "driving culture" in Padang, or willing to accept the challenge of the experience. They drive on the left side of the road (left hand traffic) with right side steering wheel (right hand drive cars). An international driving permit (license) is also required. A small 5 seater Toyota Avanza or an 8 seater Suzuki APV costs around Rp. 350,000 to Rp. 500,000 a day for a 12 to 16 hour rental. Some companies might include a driver on their charges but exclude petrol/gas. It costs about Rp. 75,000 to Rp. 100,000, depends on the negotiation. Depending on how long you stop at one interesting place, a day car rental should bring you to virtually all interesting places within Padang or Bukittinggi, and depending on whether or not you want to keep your cost low, and whether or not you have plenty of time, if you are not travelling alone renting a car might be the best option you have to choose, since you can share the cost.